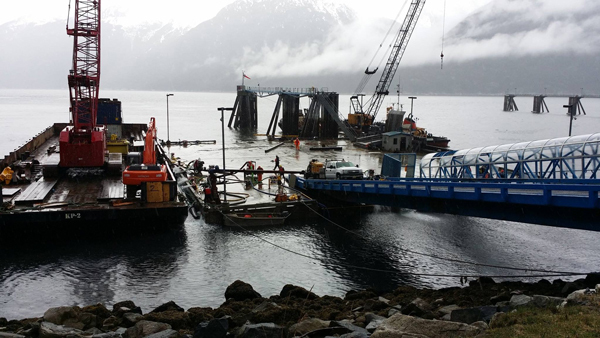 The Skagway ferry dock is floating again after a contractor hired by the state brought the sunken dock to the surface. But it’s still not ready to host Alaska Marine Highway ferries. Western Marine Construction of Juneau began working at low tide Tuesday to pump water out of the chambers that float the dock. State transportation department spokesman Jeremy Woodrow says all 24 chambers were flooded. He says it’s still not clear why. Skagway city officials think a potable water pipe that runs from the ferry terminal to the dock and underneath may have burst, but Woodrow says the state is not yet ready to declare that as the official cause. He says DOT engineers are inspecting the dock and divers will exam the structure underwater structure. Early estimates indicate repairs may run around $400,000. Woodrow says passenger ramp, electrical system and vehicle ramp hydraulic system repairs are underway, and other work will likely need to be done. Ferry service has been suspended to Skagway until at least May 9th.